Maybe you’ve had a package stolen, or maybe you want to be able to speak to someone on the other side of your door without opening it at nighttime? Maybe you’ve got to leave your kids at home but want them to be able to check to see if it’s okay to open the house while you’re gone? For whatever reason you’ve got, peephole cameras are fun solutions to all of these issues. They’re small cameras attached to controls on the interior side of the door. Many of them come with all sorts of extra features. So how do you know which one to get? Let’s take you through a list of the 10 best peephole cameras and explain what each one is good for. 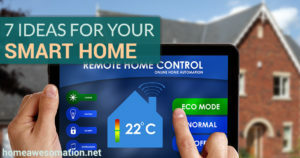 Our article on home automation ideas will have you building that smart home in no time! 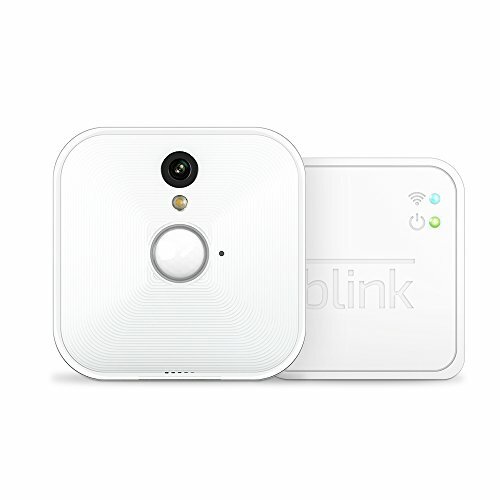 Right away we get into a one of the best peephole cameras with the Blink Indoor Home Security System. 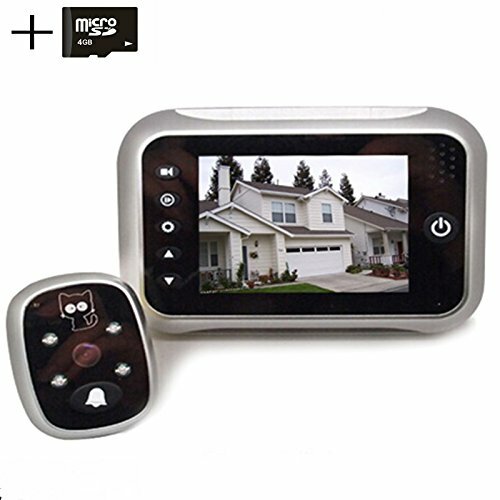 This a very affordable camera system with a sleek, modern design that can be installed on any kind of door. The white, slim build means that it fits in with almost any home, regardless of décor or the color of the host door. 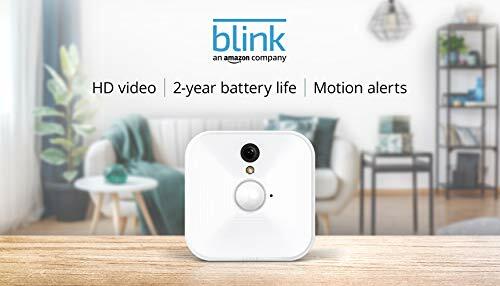 The Blink Indoor Home Security System takes video in 720p HD format, perfect for reviewing after you’re back from a long vacation or if you’re awaiting a package. The image quality is pretty smooth, even at night when color is much lower than during the day. It’s got Alexa-optimized software that lets it communicate with your home’s Alexa system. 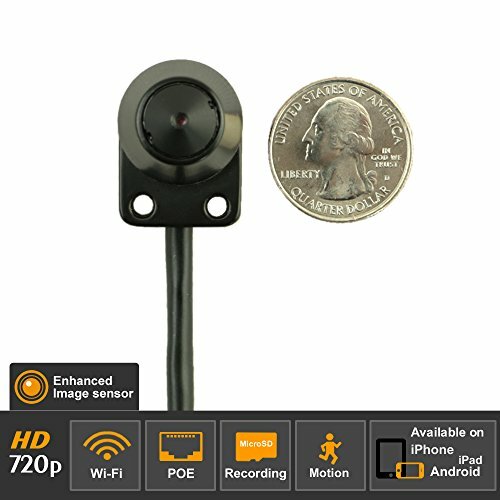 This can be great for using the camera without your hands or for viewing who’s standing at your front door without having to go check physically. The motion sensor is optimized to pick up anyone standing at your porch, but it’s not so sensitive that it’ll waste battery and storage space recording a couple of leaves blowing around in the night. Plus, this awesome peephole camera comes with free cloud storage for all the video it takes! You can’t get many deals better than that. The Blink Indoor Home Security System has a control unit that’s easy to control and simple to use; it doesn’t waste time and space on extra buttons for useless features. And with Alexa hooked up, using this peephole camera is easier than ever to configure and prime. Overall this great peephole camera is one of the better systems on our list. 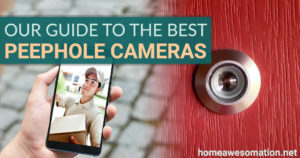 I’d recommend it for families or homeowners that don’t want to break the bank but want to make sure they get a solid camera at the same time. Digitsea brings in an excellent budget peephole camera with the Digitsea Digital Doorbell Peephole Camera. This is great for those of you trying to get a decent camera for less, but it doesn’t sacrifice much for the great value. The only negative is that batteries for powering this camera are not included, so you’ll have to make sure you have those on hand before you try this baby out. The camera takes video in a 120 degree field-of-view, allowing it to see with an eagle’s eye all around your front yard and porch. Plus, it’s entirely in color; you’d be hard-pressed to find cameras this affordable with that perk, and several of the ones on our list are only in black-and-white. 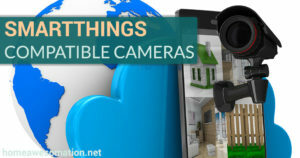 Add the night-vision functionality present in this camera and you’ve got a great device perfect for any home. 4 LED lights illuminate the space on your porch, priming it for the Digitsea Digital Doorbell Peephole Camera to take excellent photos at the touch of your finger. It records video too, of course, but the fact that you can take snapshots is excellent for storage purposes. Pictures take up much less space and you can easily capture someone hanging around your porch for proof with a picture instead of video. This camera comes with a stylish remote control with a little cat on the top. Cute, right? It’s only got a few buttons and is very responsive to touch, so controlling the Digitsea Digital Doorbell Peephole Camera is a snap. This camera is one of the cheapest on our list, but don’t discount it. 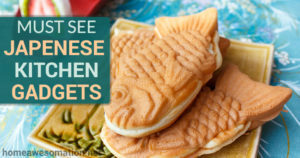 It’s perfect for anyone on a budget. Got Stairs In Your House? 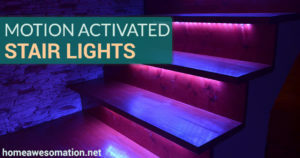 Use motion activated stair lights to keep your family safe at night! La View enters the race for the best peephole cameras with the LaView Wireless Video Doorbell Camera, and it’s a good entry. It’s a little pricy, however, so that will bar a few folks who are looking for a peephole camera in a smaller budget range. 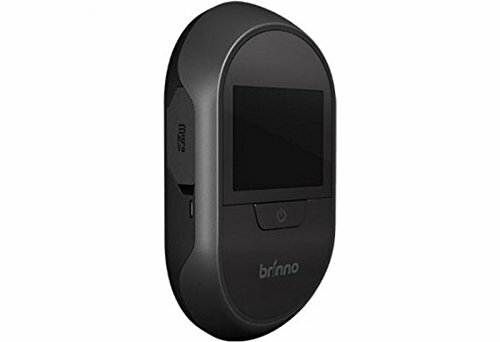 The Brinno Front Door Peephole Security Camera offers great, clear video footage that automatically records everything, without any input on your part. It records all of this footage onto an SD card that can be removed and viewed on any PC or SD-slot-bearing mobile phone. Overall the video quality here, however, isn’t as good as many of the other cameras on our list. It’s not in color, either, which is a significant minus in my book. The LaView Wireless Video Doorbell Camera sports a great perk in the form of motion-activated alerts; these are tied either to the controller or your wireless device. They alert you should something noticeable be active near your front door. This can be handy for deterring miscreants or anyone trying to steal a package, for instance, or for informing you that the mailman is here and needs a signature. The possible uses are for this awesome device are endless. Further, the LaView Wireless Video Doorbell Camera offers two-way talking, so you don’t have to open the door to have a conversation with someone on the other side. This is great in case the kids are ever left alone by themselves. The controller for the LaView Wireless Video Doorbell Camera is a slick tablet-like device that you can carry around with you if you need. It’s got a touch-screen interface and a whole host of functions and customizations. It’s a good controller for those who like to fine-tune their equipment. Overall, the price is a bit high for this peephole camera but if you’ve got the spare cash it’s worth the investment. I don’t know if I’d pay so much just for a peephole camera, however. Brinno’s camera is a small, modular device that looks like it came out of the 90s. The Brinno Front Door Peephole Security Camera is a decent peephole camera, although its features aren’t the most impressive we’ve seen. First off, the Brinno Front Door Peephole Security Camera boasts a unique knocking sensor that I haven’t seen anywhere else. This alerts you if someone knocks at the door, allowing you to answer or respond even if you’re in the back yard or elsewhere. It’s a great quality-of-life addition that raises the quality of the entire product. 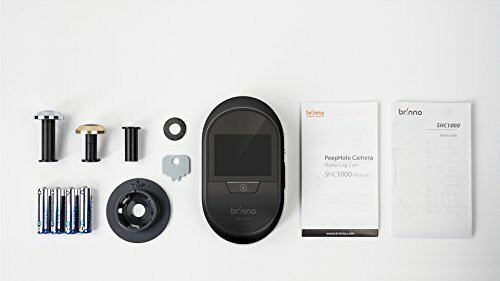 Brinno’s camera is also very easy to install; this further cements it as a peephole camera that’s ideal for those who have large houses or for older folks who don’t want to mess around with more complicated tech devices. 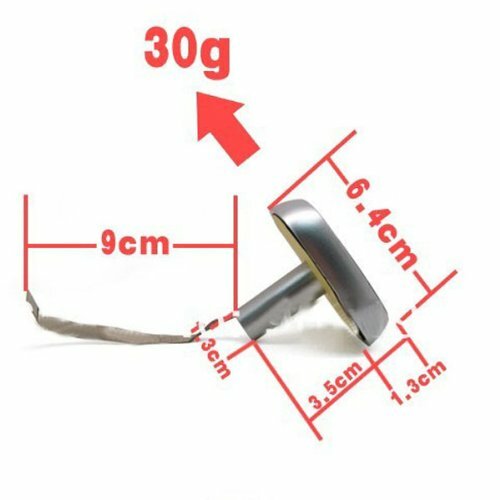 The remote for the Brinno Front Door Peephole Security Camera is really small and easy to lose track of. It’s a pretty boring shape and color, unfortunately, although the simplistic design might be appealing to a lot of people who don’t care about the specifics of their peephole cameras. This is a good buy for those who aren’t interested in details or many extra perks. It’s functional, but not exceptional, so that makes it a bit lacking when compared to many of the stars found elsewhere on our list of the best peephole cameras. This is a great WiFi peephole camera brought to us by Titathink. 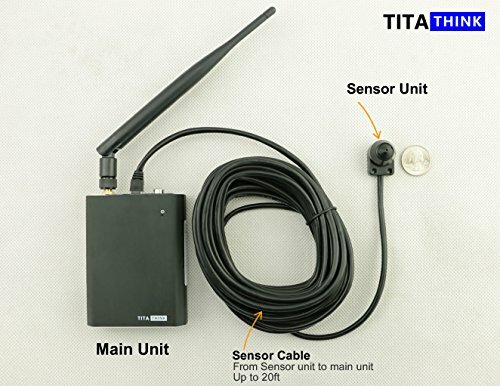 The Titathink Wireless WiFi Hidden Spy Camera is a fantastic value for its price, although it’s a bit high by most people’s standards. The Titathink Wireless WiFi Hidden Spy Camera brings crystal-clear HD images to you. It captures at 720-pixel quality with a frame rate of 30 frames per second; this ensures the video is smooth and choppiness is non-existence. Honestly, this is one of the best cameras on our list if you’re just looking at image quality. It doesn’t get much better than this when it comes to home-use, excellent peephole cameras. Motion sensors are another perk that the Titathink Wireless WiFi Hidden Spy Camera has to sway your opinion; it works for me! There are all sorts of storage options you can choose from with this camera, too: WiFi, SD card or the cloud! The customization only continues as we examine the Titathink Wireless WiFi Hidden Spy Camera’s controller. 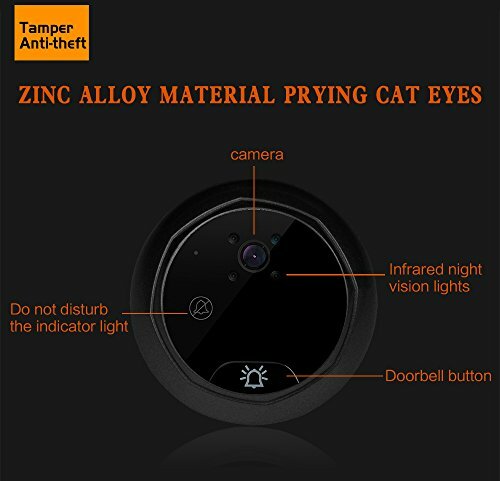 The controls for this peephole camera are very customizable; those who are savvy with their devices are going to love the control they get here. 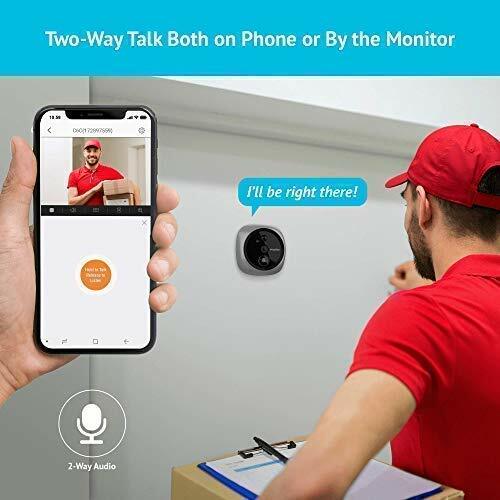 What’s great is that the entire package is so small that it really fits the definition of a “peephole camera”; it’s more like a spy camera that you can attach to your door! This is a bit expensive like some of our other cameras, but I think it’s worth the price if you want to maintain a nondescript eye on your front porch. The level of control it offers will set any safety-minded person at ease. 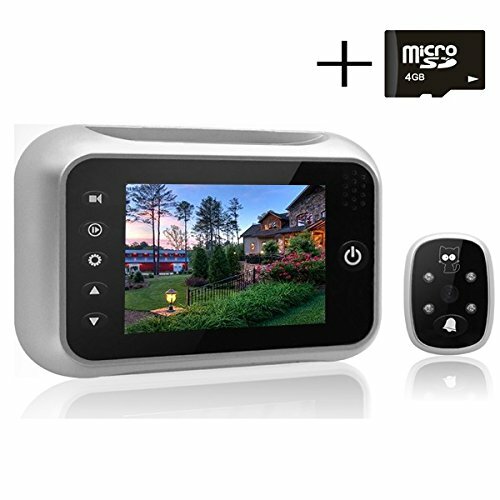 The Home Smart offering is a very affordable, versatile camera that brings a lot of features and stylish functionality to the competition. The Home Smart Video Doorbell Camera packs so much value into such a small package it’s a wonder it all works so well. The Home Smart Video Doorbell Camera’s camera sports color vision to accentuate the excellent picture quality it captures. When combined with the controller’s screen, the results are actually very beautiful. That kind of image quality is almost wasted on something as small and mundane as a peephole camera. Not to mention the 120 degree field-of-view that comes along with everything else. Home Smart did a great job, here. The Home Smart Video Doorbell Camera has 24-hour monitoring schedules that are modifiable via its controller. This is a great camera, therefore, if you’re planning on leaving your home unattended for a few days. It can also help you catch package thieves if you’re having repeated problems; they won’t be able to hide from this peephole camera! The screen control for this camera is sleek and stylish, looking like it came out of an Apple store. That it’s so slim and minimalist is a boon, for sure, since you can put it in almost any home without it appearing out of place. The touch screen is very responsive, too, and the buttons aren’t so tiny that you mash your finger against more than one too often. For the asking price I don’t know if it gets any better. This is definitely one of the best peephole cameras you can buy, bar none. It’s as good as some of our more expensive options, certainly. We’ve got another budget camera in the Digitharbor Peephole Door Camera, which gives a lot of user control in a small, affordable box. The main point of this peephole camera is video review, which we’ll explain below. The Digitharbor Peephole Door Camera has pretty decent quality from its captured images and video, of which it allows you to do both. It’s not the best resolution we’ve seen but given that you can take still pictures and video it’s a worthy tradeoff, in my eyes. The framerate is a very good 30 frames per second, however. This is the ultimate camera when it comes to total video review control. It both allows you to take videos and photos, but then goes above and beyond with its reviewing functionality. 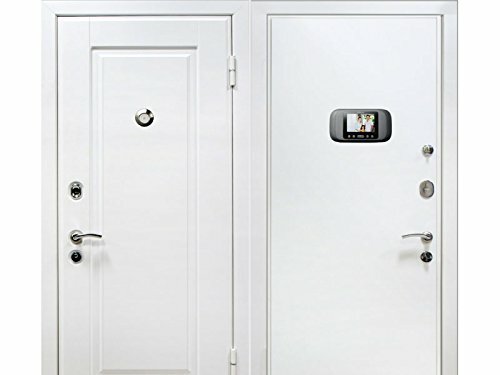 Total control to replay video or pictures and examine them is at your fingertips with the Digitharbor Peephole Door Camera. It’s a surprise that this feature isn’t included in more peephole cameras, to be honest. The little handy-dandy cat-adorning remote control is back from the Digitsea peephole camera we reviewed earlier. 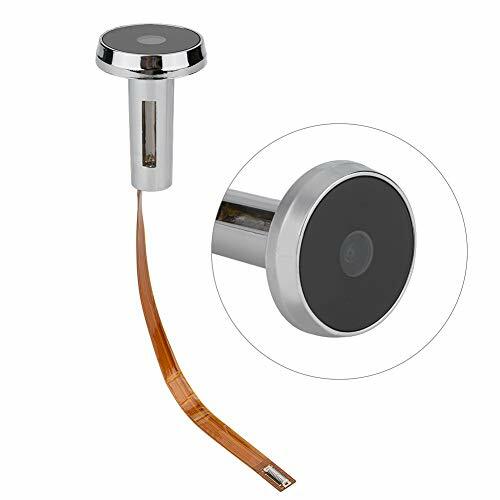 It’s just as useful and simple as before, but the Digitharbor Peephole Door Camera also offers extra controls as part of its screen package. So if you’ve got more specific desires or functions in mind, this camera will probably be a better choice for you. 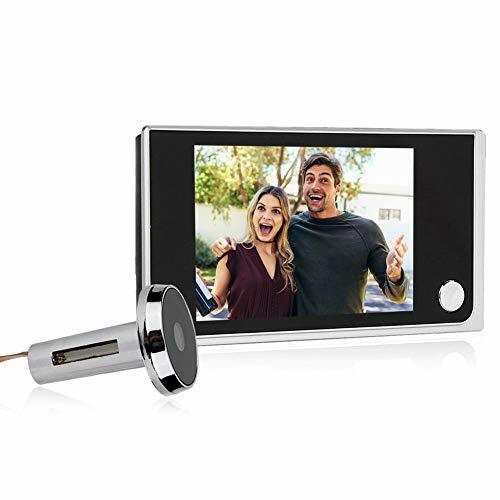 If you’re in the market for a peephole camera that lets you review your footage with fine control, grab the Digitharbor Peephole Door Camera. You won’t be disappointed, especially at its great price. This camera is a solid product that has a few specific features that allow it a place on this list, even if its visuals aren’t the most impressive by themselves. Night vision is the name of this camera’s game. This added functionality isn’t in every peephole camera so it’s good to see it here. The picture quality isn’t that great, but it’s definitely serviceable and most other peephole cameras can’t get any nighttime video of any worth. The Eques VIEU Rechargeable Peephole Camera is middle-of-the-road for this category. The one great feature this peephole camera has is its 180 degree field-of-view, the largest of all the cameras we’ve reviewed. If you’ve got a wide porch or patio, pick this camera up for this perk alone. The Eques VIEU Rechargeable Peephole Camera can be linked to a WiFi network. 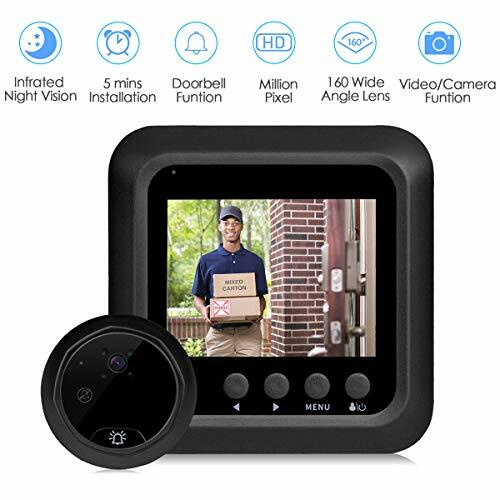 In addition, it possesses an instant-record function that’s great for tracking all the interactions at your doorstep without you having to think or worry about it. The Eques VIEU Rechargeable Peephole Camera is easily-installed, too, so this camera really seems to go for an ease-of-use focus. I appreciate it, and I can think of several folks who might see the value in that, too. The control screen for the Eques VIEU Rechargeable Peephole Camera is a little bland and ugly for my taste, but it serves its purpose. I just wish it was more aesthetically-appealing. Those with large swaths of territory to record might want to pick this camera up. Otherwise, there are other peephole cameras that do what it does but better. This is another great, affordable camera for our list. The Home Wireless Digital Doorbell Camera has a number of interesting additional features but comes in an underwhelming aesthetic package that might not sway customers who are looking for something sleek. The Home Wireless Digital Doorbell Camera bring HD visuals to your eye with a 160 degree field-of-vision, the second largest of any peephole camera on our list. The image here is really excellent and crisp; you can see a lot of details from your indoor vantage point. It also comes with night vision and color recording, so this camera adds the whole suite of image bonuses to its features. This camera comes with 3 adjustable modes of operation, depending on what you need to use the camera for or who you’re trying to track. This extra modifiability is enhanced when you consider the energy saving setting it’s designed for; those who are conscious of either their energy bill or the environment will want to consider the Home Wireless Digital Doorbell Camera. Running a peephole camera all day can be pretty taxing for a home’s electric bill, after all! The control screen for the Home Wireless Digital Doorbell Camera is black and simplistic, with all its buttons arrayed on the bottom. It suits this camera’s retro-style design, emphasizing functionality over form. The control is a bit of an awkward shape, however, so it might not fit or rest well in every location. 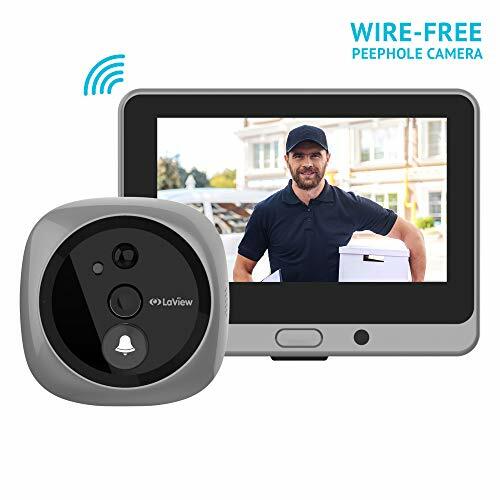 Altogether, the Home Wireless Digital Doorbell Camera is a very decent peephole camera that I’d recommend for anyone who wants to keep their electric bill down. This is a basic peephole camera that would find good use in the hands of children or seniors. The basic design and hands-off settings make it easy to install and use. The image of the Eques Digital Door Viewer isn’t the greatest, although it’s a pretty cheap peephole camera so you’re getting what you pay for, in this case. The image quality isn’t bad, just not as impressive as other cameras we’ve reviewed. In any case, the Eques Digital Door Viewer records well enough that you can review the footage and know what you’re looking at. 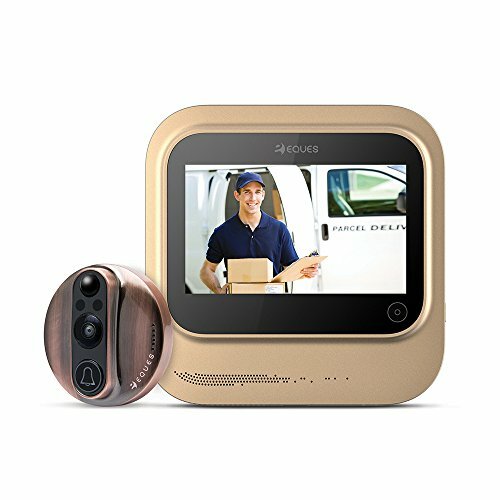 The reflective mirror that protects the Eques Digital Door Viewer keeps anyone from pressing their eyes up to your peephole camera and ruining your image. This is a level of stealth that might be valuable if you don’t want your patio guests to know they’re being recorded, too. It begins recording instantly, a nice hands-off perk that is good for child or senior users. 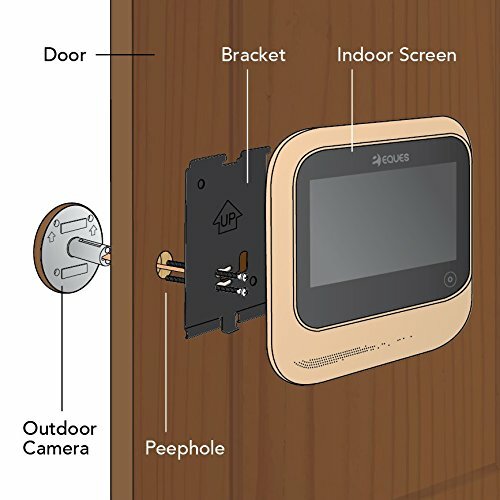 Finally, this peephole camera has free SD card storage, too! This controller is a little bulky and shaped like a rectangle, which can make fitting it beside a door a bit difficult. The buttons are not the most responsive but the Eques Digital Door Viewer’s controller is very sturdy. It gives the impression that it will not fall apart after quite a while. The interface screen could use a little more detail, I’d say. This is a pretty decent camera whose hands-off features make it a worthy buy if you want to set-and-forget. The additional reflective mirror is a great way to mask your camera’s presence, and that might be the deciding factor for some folks who are concerned with secrecy. Peephole cameras are great solutions for all kinds of monitoring or recording needs. Hopefully we’ve shown you exactly what each of these cameras is capable of. Now you just need to decide what your budget is, what you’re looking for, and what you could live without. Whatever your choice, have fun with your new camera!